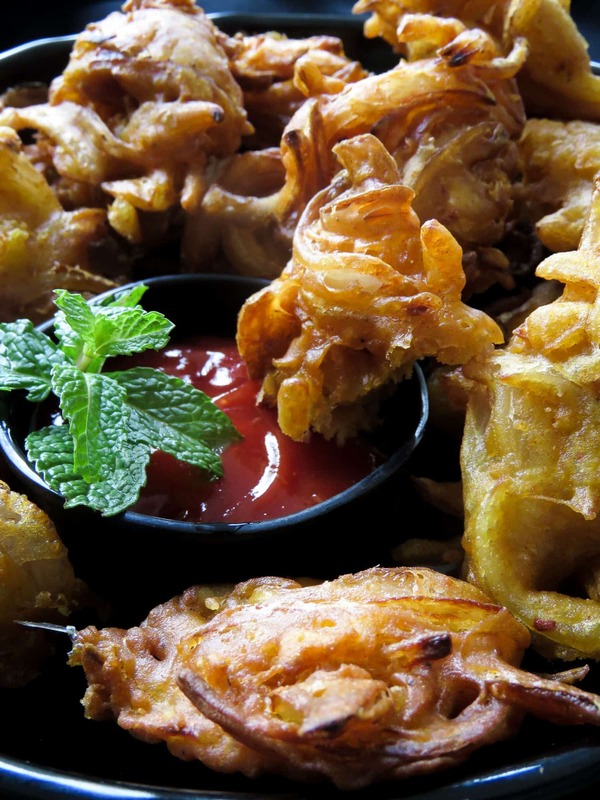 Crispy deep-fried onion fritters light, crunchy and ideal for any time of the day, serve this savory bites as an appetizer or snack. 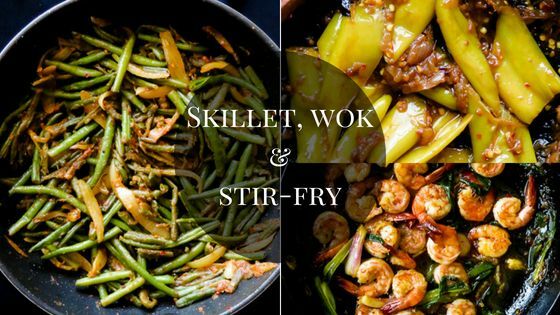 all you have to do is mix the ingredients in a bowl and start deep-frying. Craving for something crispy, deep-fried to go with your cup of tea? 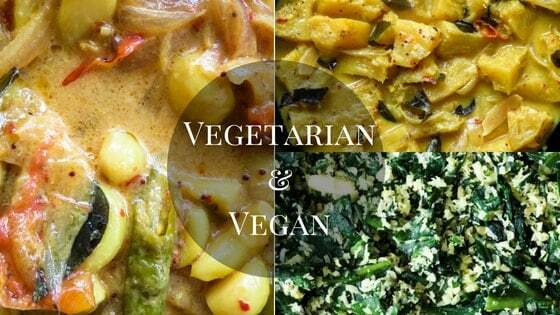 Then all you need is onions, a few spices, the most basic batter and a bowl to mix it all in. 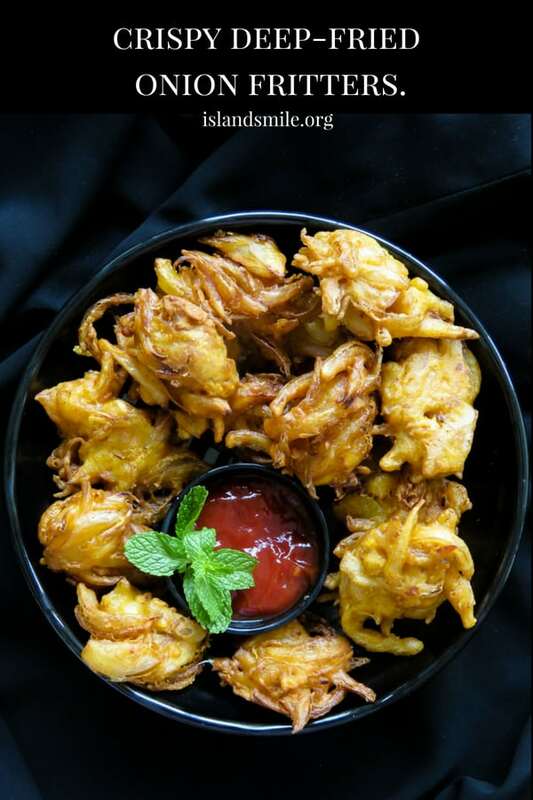 If you love making evening snacks or want something different to serve for the Ramadan iftar table, then you need to make these onion fritters. What is the consistency of the batter for the onion fritters? 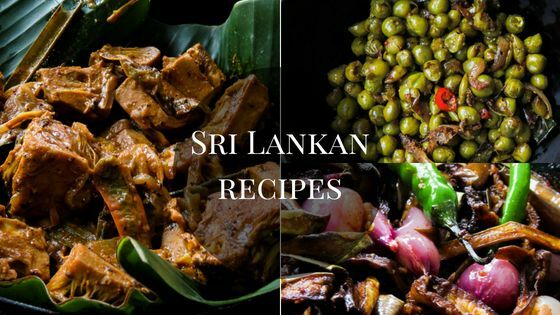 The most important part of the recipe is to get the consistency of the batter correct, it should have the consistency of a pancake batter(not crêpe batter)and the onions should stick to the batter. A few notes on making the deep-fried onion fritters. 1/ As mentioned above the consistency of the batter should be right. 2/ if you find the batter to be slightly runny, add a tablespoon or two of extra flour to get the correct consistency. 3/ only add the batter to the oil when it reaches the correct temperature. 4/ once you add the batter let it fry for a minute or two and then use a spoon to turn and fry evenly. 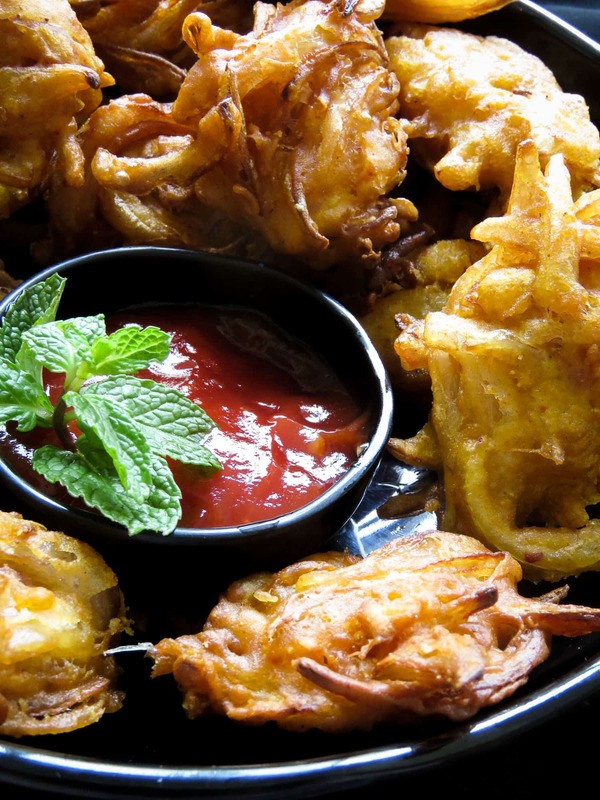 Use a large bowl to make the onion mixed batter and have a plate covered in paper towels for the fritters. Cut the onions into thin slices and transfer them to the bowl. Add turmeric, coriander, cumin, chilli to the bowl and combine with the onions. Add rice flour, baking powder, flour to the bowl and combine lightly with a spoon. Gradually add water to the onion mixture and mix well. make sure the batter is not runny but a has the consistency of thick batter for pancakes. Taste batter for seasoning, set aside for 5 minutes while you heat the oil. 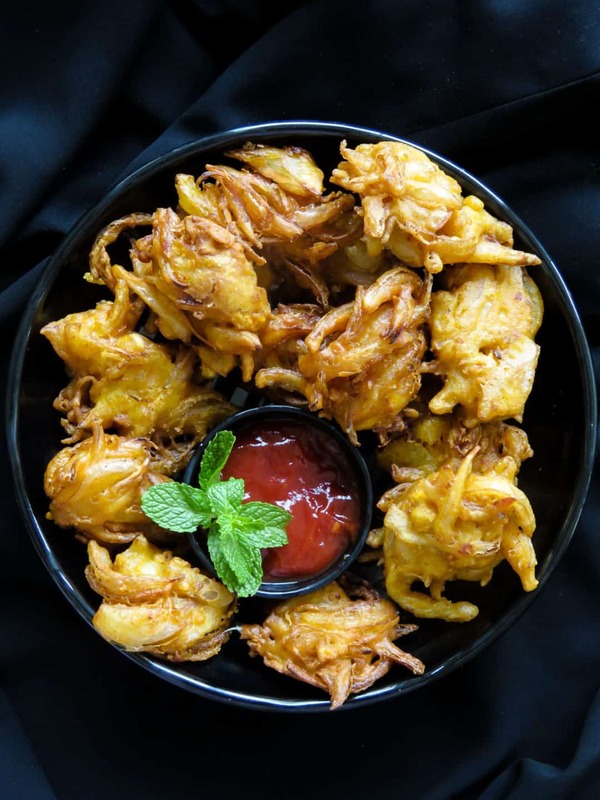 Place a deep-frying pan over medium heat and gradually bring the heat up to the correct temperature, check the temperature is right by dropping a little batter if it sizzles and floats the oil temperature is just right to fry the fritters. Add a spoonful of batter with the onions, let it fry for a minute and then turn the fritter to fry all sides evenly, fry in small batches of 4-5. Serve warm while the fritters are still crispy and have a crunch to it. 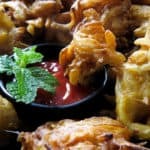 CRISPY DEEP-FRIED ONION FRITTERS- LIGHT, CRUNCHY AND IDEAL FOR ANY TIME OF THE DAY, SERVE THIS SAVORY BITES AS AN APPETIZER OR SNACK. 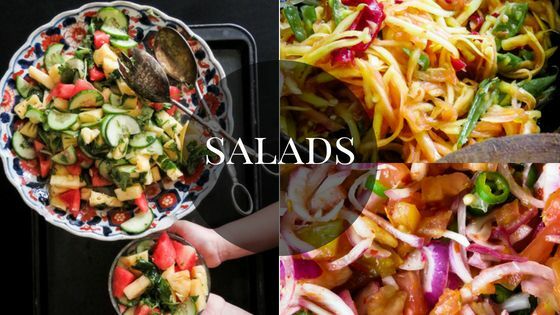 ALL YOU HAVE TO DO IS MIX THE INGREDIENTS IN A BOWL AND START DEEP-FRYING. 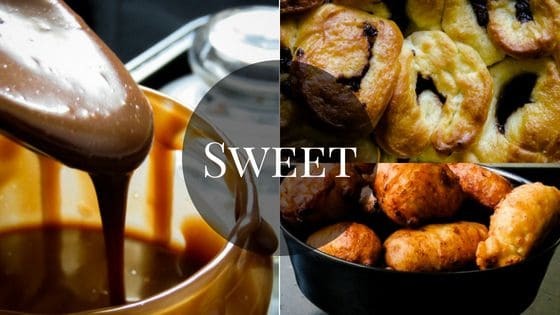 Place a deep frying pan over medium heat and gradually bring the heat up to the correct temperature, check the temperature is right by dropping a little batter if it sizzles and floats the oil temperature is just right to fry the fritters.